WA high school orchestra students represented the WA Concert Orchestra at the district level last weekend. Senior, Taylor Everett, and juniors, Hannah Billings, Alyssa Allen, and Audrey Aguiar joined the Solo and Ensemble Festival on Saturday, December 1. The District Festival is a county‐wide event, allowing students to perform individually or as an ensemble for an adjudication. The quartet achieved the highest score among participants—a superior rating. 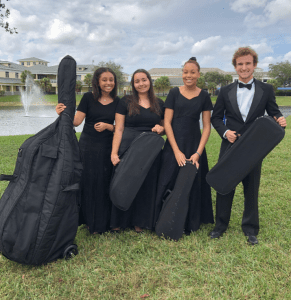 With their superior rating, the Westminster Academy String Quartet will perform at the state level later in the school year.